This month's theme was loads of fun! On the farm couldn't have come at a better time. My son is just learning to talk and learn about animals and the sounds they make. This month at our Tales for Tots we read this adorable finger puppet book. You may of heard of it before? 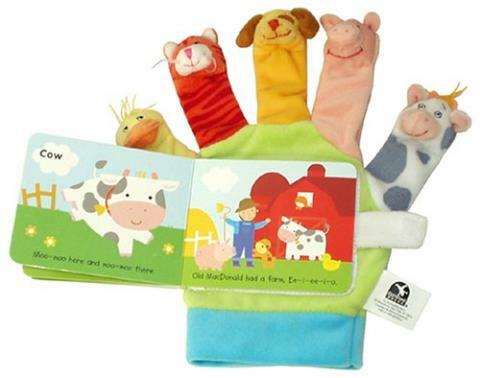 Old MacDonald Had a Farm is a fun, interactive finger puppet book that got all the kids oinking, mooing and giggling. Scholastics sent us a copy of this book to give away and one lucky tot got to take it home! We of course sang the classic song, Old MacDonald Had a Farm and we talked about all the things you can find on a farm, like trackers, barns, cows, pigs, cats and more! After the toddlers got to do a fun craft using their foot for the base of the tractor. 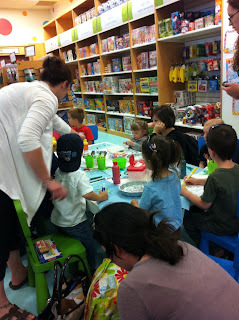 It was little messy but fun! 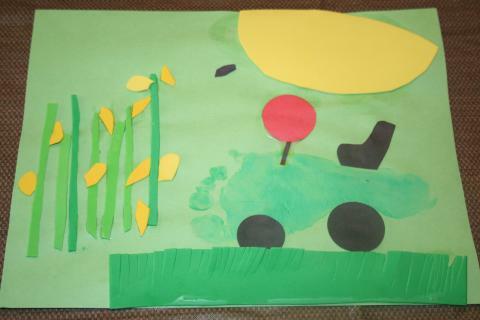 It's a great craft for kids to practise cutting and pasting. Check out how to make this craft here. Our infants sat around while the big kids got their craft on! Thanks to Scholastics for sending us this adorable book and for Chapters Polo for having us again! Baby Basics: Babies Beating The Drum! Come help us celebrate momstown's 5th Birthday! List of Toxic Chemicals in Your Home!